By sponsoring this story, The Last Fling Pumpkin Sling would like to thank Terry Lee for all accomplished for Warren County and for veterans of the military. We are especially grateful for his work with Rolling Thunder NJ Chapter #3. That’s why we’ve pledged a portion of the proceeds from this year’s event to this very deserving cause. We hope to see you at Pocono Raceway! Terry Lee passed away in January, 2016. 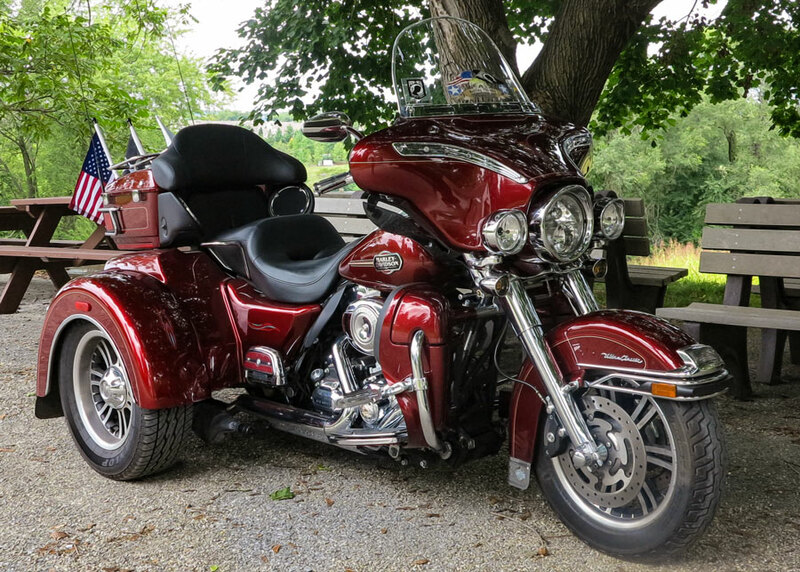 I meet Terry Lee and his Ember Red Sunglo Tri Glide Ultra Classic Harley Davidson three-wheeler in Blairstown on the northern end of Warren County. Besides the fun motorcycle ride I anticipate, Terry plans to show me important places of historic worth, sentimental value and natural beauty that together makes a great day trip. We head southwest to Route 46 where great chunks of limestone outcropping were sliced through to make this road alongside the Delaware River. From Blairstown through Knowlton and White Townships to Belvidere we went. Overcast and in the 70s, the chills on my skin turn warm as we enter Belvidere with trim, colorful houses of proud owners, a town square that could vie with any New England green, and an impressive Warren County Court House built in 1825, the same year Warren County seceded from Sussex County. It has since been in continuous use. Garrett Wall, wealthy landowner in the 1820s, donated land and $2,500 to build the court house. “He wanted to make sure everything stayed here,” says Lee, retired county clerk for thirty-three years who performed marriages and naturalizations. This soldier tells a story at the Warren County War Memorial in Belvidere. Next to the Court House and part of its view, a grand War Memorial depicts the names of all known Warren County deceased veterans from World War I to present with names still being added. The memorial exemplifies the respect, appreciation and gratitude that forged its creation. Leo Becker, WWII navy vet, organized a bunch of friends together to come up with a design and raise money for the War Memorial. 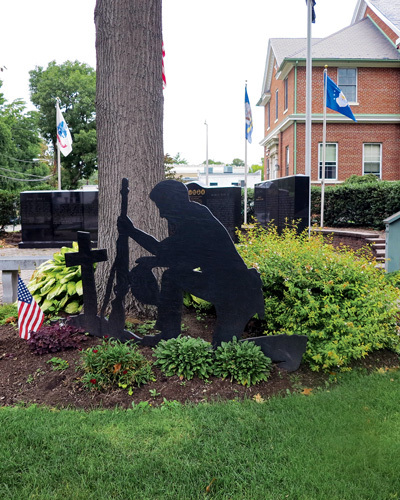 A core group of volunteers including 88-year-old Leo hand built the War Memorial in six weeks and started a nonprofit organization called The Warren County War Memorial Corporation in 1998. Terry still mows the grass, kills weeds and fertilizes flowers on the quarter-acre plot. Two years later, Terry and friends and Chapter 700 of the Military Order of the Purple Heart built the Purple Heart Memorial for all vets who were wounded. Inside the summer kitchen at Van Nest-Hoff-Vannatta Farmstead. Down the road to Harmony Township the Tri Glide purrs like a big cat. We arrive at the Van Nest-Hoff-Vannatta Farmstead, a complex of rural beauty straight from a painting. Terry is Vice Chair of the grass roots Harmony Township Historic Preservation Committee that leases and restores the state-owned buildings. The barn has a hex sign from Quilts Across America. After years of being struck several times by vehicles, they moved three wagon houses back from the road with the aide of a county grant. The buildings were disassembled and put back together, piece by piece. This award-winning farmstead exemplifies not only a bucolic lifestyle, but also one of hard work and a love for the land. 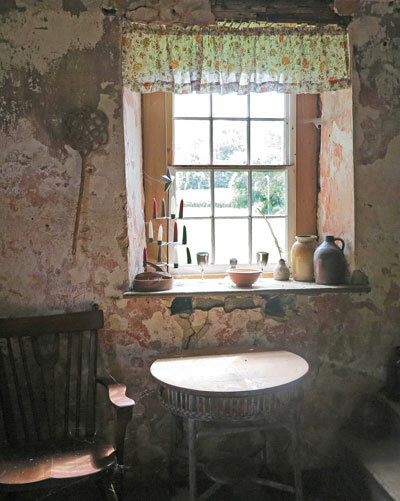 The Harmony Township Historic Society helps with lots of events here such as the autumn Open House in the sparkling stone summer kitchen and double-walled stone house. 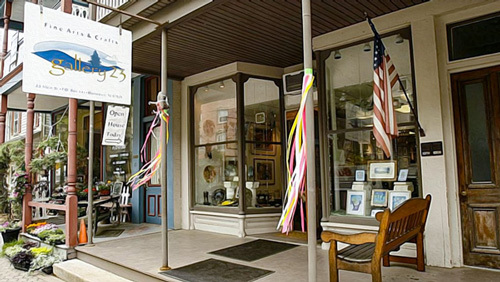 Purring down the road again through Lopatcong Township to Greenwich Township we putt through Stewartsville and as we slow warmth takes the place of chill—a marked difference between heat reflected by the built surfaces that make a town and the coolness of natural areas. We pull into Old Greenwich Cemetery, home to gravesites of twenty Revolutionary War soldiers, including Brigadier-General William Maxwell, and the Old Greenwich Presbyterian Church. History notwithstanding, I am struck at the frequent family graves with four, five, six, children, some babies, their gravestones so bleached and eroded that you must rub them with your fingers to feel what’s left of their names and dates. What happened so long ago that whole families succumbed? Terry Lee at the door to his former family home, now the James and Mary Lee Museum at Morris Canal Inclined Plane 9. On to Inclined Plane 9 West of the Morris Canal and former home of Terry Lee and his family. We drive up the driveway, the very inclined plane that canal boats rode up and down in wooden cradles. Cables pulled the cradles on tracks, and the cables were powered by canal water and a monster turbine that weighed thirteen tons and revolved once per second. Abandoned since 1923 and disassembled, James Lee, Terry’s dad, a railroader, bought the property in 1946. Terry’s family uncovered it all by hand with a little tow truck help. Though Terry was just twelve and his sister slightly younger, “canal” ran in their blood. Their grandmother, Isabelle Lendstrome, was born on a canal boat somewhere between Port Colden and the town of Washington and was a mule tender at age twelve. “It was neat growing up there,” says Terry. “Just us and the farmers around the area. We had to walk through the back fields to school. I was fortunate to grow up in a household where we were very close. Mom’s work was us kids. 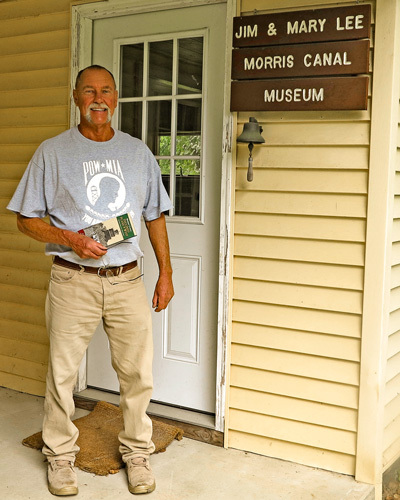 We still all remain very close.” Terry’s home, now part of the State and National Registers of Historic Places is the James and Mary Lee Morris Canal Museum and is testament to the character of an American family, heritage, engineering and creativity. 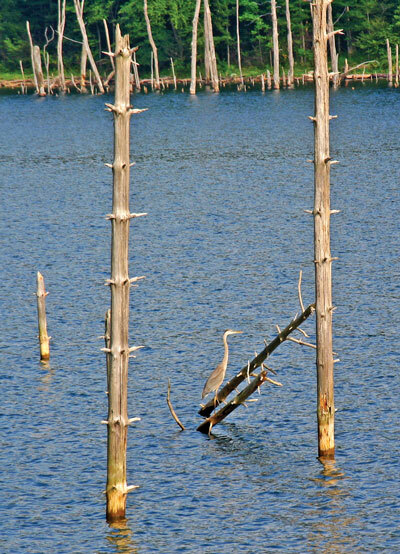 Great blue heron at Merrill Creek. Heading out to Merrill Creek Reservoir, we glide past Thomas Edison’s Concrete Mile, New Jersey’s first concrete highway built in 1912. We ride to the reservoir on Scott’s Mountain through woodland. 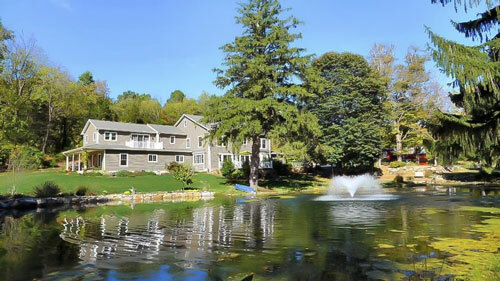 For an exciting walk around the privately owned 650-acre reservoir surrounded by a 290-acre environmental preserve take the Perimeter Trail through patches of woods, over four dikes and maybe you will see the resident bald eagles. Who says power companies are bad guys? Last stop: lunch at the Old Log Cabin Inn in Columbia for down home fare while and getting a chance to talk with Mr. Adventure. Terry Lee visited every continent on this earth and many of the countries within, first during a four-and-a-half-year stint in the Coast Guard, then later because he wanted to see the world. He spent two-and-a-half years on the Cutter Dallas doing Search and Rescue, then got orders to take a slow boat (thirty-two days) to Viet Nam to the mouths of rivers where they headed off Viet Cong supply boats. He visited a lot of ports and took some R&R in the Far East. During the Cold War, he spent thirty-five days in the North Atlantic keeping an eye on Russian “fishing” boats, factory ships with radar and other things. We putt back to my truck, this fun day over. Back in the A&P parking lot I wave good-bye to an icon of Warren County, a man who leaves a trail with breadcrumbs for others to follow. Warren County's Montana Mountain, Merrill Creek Reservoir, and the Pohatcong Valley is equally rewarding for students of history and devotees of the outdoors. The UACNJ facilities in Jenny Jump State Forest, near Hope in Warren County, are 1,100 feet above sea level, one of the few dark sky locations left in the state. 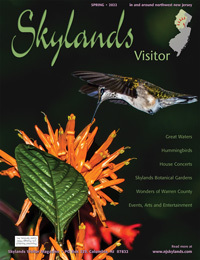 An adventure every season on scenic steam train excursions along the Delaware River staffed by enthusiastic volunteers! 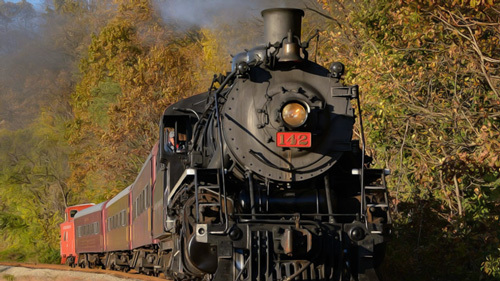 Catch the Warren County Winery Train, River and Steam Train Ride, Mine Train, Day Out With Thomas and many more!